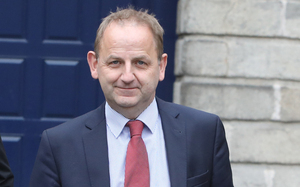 A journalist has informed the Disclosures Tribunal that former head of the Garda Press Office Supt Dave Taylor confirmed the Ms D allegation against Sgt Maurice McCabe to him. He’s also told the tribunal Supt Taylor suggested that he should travel to Cavan – where the D family lived. This is alleged to have taken place in 2014. The journalist no longer works for the newspaper with whom he was attached when this occurred. His former editor has also confirmed to the tribunal that the journalist told him about the Ms D allegation and that he – the editor – established that the journalist’s source was Supt Taylor. The editor has told the tribunal he was not interested in publishing a story on the matter. It’s understood that the journalist, who has confirmed to the tribunal that Supt Taylor told him to travel to Cavan, first heard about the Ms D allegation from another source. It’s understood the journalist then contacted Supt Taylor and Supt Taylor confirmed the matter to him and then suggested he should go to Cavan. The journalist is not one of the 11 journalists named by Supt Taylor as having been briefed by him. 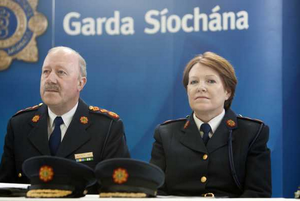 The tribunal is examining allegations made by Supt Taylor that, at some point in the middle of 2013, he was instructed by the then Garda Commissioner Martin Callinan – with the knowledge of the then deputy Garda Commissioner Noirin O’Sullivan – to negatively brief journalists about Sgt McCabe. He said this would have occurred up until the then Garda Commissioner Martin Callinan resigned on March 25, 2014. Supt Taylor alleges that he was instructed to convey to journalists that Sgt McCabe – who was raising concerns about poor policing in Cavan/Monaghan district at this time – was driven by maliciousness and motivated by revenge due to an allegation of sexual assault made against him in 2006. This was the allegation made by a woman referred to as Ms D – the daughter of a former Garda colleague of Sgt McCabe’s, who was sanctioned after Sgt McCabe made a complaint on foot of the colleague attending the scene of a suicide after drinking alcohol. In April 2007, the DPP found Ms D’s allegation had no foundation. Supt Taylor alleges that he was instructed to tell journalists about this allegation and to tell them that the DPP ruled against a prosecution, but that he was to convey that it was still the “root cause” of Sgt McCabe’s complaints about poor practices within An Garda Síochána. Supt Taylor has named 11 journalists as having been briefed by him. They are: Debbie McCann, of the Irish Mail on Sunday; Eavan Murray, of the Irish Sun; Paul Williams, of the Irish Independent; Paul Reynolds, of RTE; Michael O’Toole, of the Irish Daily Star; Juno McEnroe, of the Irish Examiner, Daniel McConnell, of the Irish Examiner; Cormac O’Keeffe, of the Irish Examiner; John Burke, of RTE; and Conor Lally, of The Irish Times; and John Mooney, of The Sunday Times. Supt Taylor only added Ms McCann and Ms Murray to the list after the D family – who gave evidence to the tribunal last summer – told the tribunal that Ms McMcCann and Ms Murray had visited the D house in early 2014. Ms McCann, Ms Murray and Paul Williams are the only journalists to have called to the D house in early 2014 – with just Mr Williams subsequently writing about Ms D and Sgt McCabe. Mr Williams was put in contact with Mr D via Detective Superintendent John O’Reilly. Mr O’Toole, according to Mr D, tried to contact him on Facebook around this time. None of the 11 named journalists have corroborated Supt Taylor’s claim. Debbie McCann told the tribunal that she had heard “murmurings” about Sgt McCabe in early 2014. Ms McCann refused to tell the tribunal if she spoke to Supt Taylor before and after travelling to the house of Ms D in 2014 – on the basis of journalistic privilege. Supt Taylor maintains that he did speak to her before and after she travelled. Asked if she even thought about contacting Supt Taylor about the allegation, Ms McCann said she felt she couldn’t answer that question due to journalistic privilege. She said if she had contacted anybody in relation to the allegation “it would have been purely on an off-the-record basis”. Ms McCann also spoke of what her knowledge was about the allegation before travelling to the D house. She also said she knew the names involved and that the allegation pertained to the daughter of a colleague of Sgt McCabe’s. The tribunal also heard that on the day Paul Williams’ first article on Ms D was published in the Irish Independent – on April 12, 2014 – Supt Taylor had texted Ms McCann. At this point, Ms McCann was on maternity leave and she had a two-week old baby. Asked about the contents of the text, Ms McCann said she couldn’t recall. Asked if it was about Mr Williams’ article, Ms McCann said she couldn’t disclose any details of her conversations with Supt Taylor due to source protection reasons. Michael McDowell SC, for Sgt McCabe, asked Ms McCann if she believes being told the following facts – that there had been an allegation made against Sgt McCabe, that the allegation had been investigated, and that the DPP ruled against prosecution – if she would consider that a smear. Eavan Murray, of the Irish Sun – of News International – had initially told the tribunal, in correspondence, that she wouldn’t be commenting on her news gathering activities or sources. But, when she gave evidence – several days after the chairman Supreme Court Judge Peter Charleton warned he knew “an awful lot of people haven’t told me the truth” – Ms Murray apologised for this and said it felt counterintuitive at the time to reveal anything about her communications with Supt Taylor – due to journalistic privilege. She also conceded that telling the tribunal – at an earlier stage – that Supt Taylor hadn’t briefed her about Sgt McCabe wouldn’t have infringed on her journalistic privilege. It was put to her that she kept the tribunal “in the dark” about her position for a year and five months and Ms Murray apologised. She admitted that she now wishes that she had told the tribunal of her position sooner. Ms Murray told the tribunal how she started a full-time position as a news reporter at the Irish Sun in November 2013. She said she first met Supt Taylor in early 2014 during a week when there had been seven murders in seven days and she met him at several crime scenes during that week. Her first phone contact with him was around February 10, 2014 and Ms Murray explained she was told by her crime editor Stephen Breen to make herself known to Supt Taylor as he was going on holidays and she would likely be stepping in for him while he was away. Ms Murray said Mr Breen told her she should contact Supt Taylor so that she would be added to the Garda Press Office mailing list. Ms Murray said that, at that time in early 2014, she barely knew Supt Taylor. She said she never spoke to Supt Taylor about Ms D before she visited the D house. She said the tribunal had been wrong in its understanding of when Ms Murray visited the house. It has been previously stated that Ms Murray was the second journalist to call to Ms D’s house in early 2014 – after Ms McCann and before Mr Williams visited the house and interviewed Ms D on March 8, 2014, and videoing part of that interview, following a visit to meet Ms D’s parents on March 5, 2014. This is the evidence of Mr and Mrs D.
But Ms Murray said she must have called to the house after Mr Williams because when she met Mr D and Mrs D, she said they were anxious about the video interview Mr Williams did with their daughter. Ms Murray said she was told to travel to the family by her then news editor Fergus O’Shea – after the Irish Sun learned that Mr Williams had an “exclusive” pending on Ms D and Sgt McCabe. Prior to this instruction from Mr O’Shea, Ms Murray had been aware of an allegation of sexual assault against Sgt McCabe since early 2014. She said the source for this information wasn’t a guard. Ms Murray said, after she was told to travel to Cavan, she found out the D family name via a journalist friend “who would have been very good” to Ms Murray and then subsequently obtained the landline phone number for the D family “fairly easy” through directory inquiries. She then called ahead of her visit to the D house. While Ms Murray didn’t tell the tribunal the identity of this journalist friend, who told her the name of the D family, she confirmed to the tribunal it wasn’t Ms McCann or Mr O’Toole. After meeting with Mr and Mrs D, Ms Murray told Mr O’Shea in the Irish Sun that there was nothing that could be published and she said the newspaper wasn’t interested in the story. Ms Murray went on to tell the tribunal that – about a week after her visit to the D house – she did speak to Supt Taylor about it. 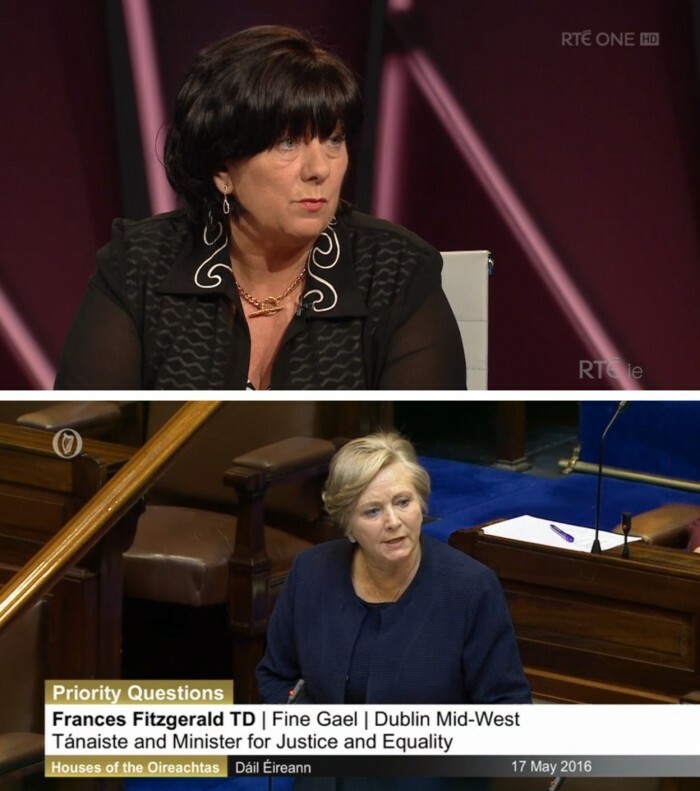 Ms Murray was referring to the comment made by then Transport Minister Leo Varadkar that Sgt McCabe was “distinguished” on March 20, 2014, at a Road Safety Authority conference in Dublin Castle – just days before Mr Callinan stood down. Mr Varadkar was calling on the then Garda Commissioner Martin Callinan to withdraw his “disgusting” remark about the actions of Sgt McCabe and former Garda John Wilson – which he made in January 2014. McDowell: So would you now tell me how, in that context, the allegation of sexual abuse arose in conversation between yourself and Superintendent Taylor? Murray: He was giving out about Leo Varadkar. Murray: He just thought he was causing trouble for Commissioner Callinan. Murray: No, I said to him: You know that allegation, I actually interviewed those people, there was nothing in it. McDowell: How was that relevant to whether he was ‘distinguished’ rather than ‘disgusting’? McDowell: You know that allegation you put to him, isn’t that right? You just said now: I said to him, you know that allegation, I actually interviewed those people, there’s nothing in it. McDowell: So you must have had some prior conversation about it? McDowell:… goes on and saying that he is distinguished. How do you get from that to a discussion about Ms. D’s allegation of sexual assault? Murray: I said it to him. I said, I told him. McDowell: You told him what? Murray: That I had been up there to Cavan. Murray: There hadn’t been a huge amount of dealings with him, though. McDowell:…or must have brought up the subject with him of the sexual allegation? Murray: I have no recollection of ever bringing that up with him, ever, or him bringing it up with me. Ms Murray was shown phone billing records which show she spoke on the phone and texted with Supt Taylor on April 12, 2014 – the day Mr Williams’ first article on Ms D and Sgt McCabe was published in the Irish Independent. Ms Murray said she’s sure they didn’t discuss Mr Williams’ story during these communications. The tribunal also heard that Ms Murray had approximately 12 texts or calls from Supt Taylor before she visited the D house and then approximately 28 texts or calls from Supt Taylor between the visit to the D house and when they discussed her visit to the house. Several months after Supt Taylor left the Garda Press Office in June 2014, the tribunal has already heard that there were more than 11,000 phone contacts between Supt Taylor and Ms Murray. This was discovered during a criminal investigation into the leaking of material or information by Supt Taylor to journalists. At this time, Ms Murray was helping him with his college work for this Masters in Political Communication. Paul Williams repeated to the tribunal last week – after giving evidence to the tribunal last summer – that Supt Taylor never negatively briefed him about Sgt McCabe. He’s also told the tribunal that he was never negatively brief about Sgt McCabe by either Mr Callinan or Ms O’Sullivan. He also said he didn’t know Ms Murray and he was “very surprised” to hear Ms Murray and the Irish Sun had heard he was working on an exclusive about Ms D.
Mr Williams’ articles on Sgt McCabe and Ms D were published on April 12, 15, 16 and May 3, 2014. During the timespan of these articles, on April 29, 2014, Ms D emailed the Garda Siochana Ombudsman Commission (GSOC) claiming her allegation of sexual assault was not properly investigated and, a day later, on April 30, 2014, she met Fianna Fáil leader Micheal Martin in the Dáil. Mr William flagged Ms D’s desire to make a complaint to GSOC and to meet Mr Martin in his earlier articles. When Ms D did eventually give a statement to GSOC, on July 3, 2014, Ms D told GSOC that Mr Williams told her senior members of An Garda Siochana and in the Government were aware of her allegations. When asked about this, Mr Williams said it was a “throwaway remark” that Supt Taylor said to him and that he later relayed it to Ms D.
Mr Williams told the tribunal last week that when he went to the D house, Mr and Mrs D told him unequivocally that two journalists – Debbie McCann and Eavan Murray – had previously called to the house. In addition, counsel for the D family has told the tribunal that it’s their case that Ms Murray went to the D house before Mr Williams called. Mr Williams told the tribunal that the video he took of some of his interview with Ms D was on his laptop and he gave it to the tribunal and Mr Williams said he doesn’t believe the video was edited. In addition, phone records that the tribunal have show Supt Taylor and Mr Williams weren’t in phone contact on the day Mr Williams interviewed Ms D – March 8, 2014. Supt Taylor had alleged that Mr Williams called him on the day he interviewed Ms D and said “guess where I am?”. Mr Williams says this did not take place. Mr Williams says he also subsequently asked Supt Taylor if the Ms D matter had ever been placed on PULSE. The tribunal heard that last week Mr D checked PULSE for entries on Sgt McCabe on March 23, 2014. Asked if he asked Mr D to make this check, Mr Williams said he didn’t. It was he, as I said last year, told me that the incident wasn’t recorded on Pulse. And I put that to — and his daughter had an issue with that so I put that to Dave Taylor at the time. I don’t know whether I put that subsequently to him. Mr Williams claims Supt Taylor then came back and confirmed this to him – after he interviewed Ms D.
Mr Williams said he kept his contact with Supt Taylor “very straight”. In relation to phone calls he shared with Ms O’Sullivan in February 2014, Mr Williams said they were about security issues about himself and they were “absolutely not” about Sgt McCabe. Paul Reynolds told the tribunal that he was never negatively briefed about Sgt. McCabe (we are working on a comprehensive report of Mr Reynolds’ evidence for tomorrow). Mr Lally said he did hear about a historical allegation against Sgt McCabe in 2011 or possibly 2010 – before Supt Taylor started working the Garda Press Office – and that he can’t remember who told him. He said the person who relayed the information to him also told him that the allegation was “completely thrown out by the DPP”. Mr Lally said the allegation was “doing the rounds in journalistic circles” in 2013 and 2014. Sgt McCabe is suing The Irish Times over an article which Mr Lally wrote about Ms D in February 2017. Michael O’Toole, of the Irish Daily Star, told the tribunal that he first heard a rumour about Sgt McCabe in 2011/2012 – before Supt Taylor started working in the Garda Press Office – from a “very experienced journalist with significant access to the political world”. Mr O’Toole said he checked out the matter with another person who had “done files” with Sgt McCabe and, following their communications, Mr O’Toole was satisfied the matter was “dead” to him, due to the DPP’s directions. Mr O’Toole said this person was not someone from Garda HQ or the Garda Press Office. “Nobody in An Garda Síochána smeared or negatively briefed me about Sergeant McCabe. When Mr O’Toole gave evidence, Diarmaid McGuinness SC, for the tribunal, said Mr O’Toole had recently “come into possession of some information that the tribunal is looking into” and that Mr O’Toole would be “providing a very short statement to the tribunal dealing with that”. The tribunal has yet to hear any of details of this information. Last summer, Mr D told the tribunal that Mr O’Toole had attempted to contact him via Facebook at around the time Ms McCann, Ms Murray and Mr Williams were in contact with the D family. Nobody asked Mr O’Toole about this when he gave evidence. John Mooney, of The Sunday Times – of News International – told the tribunal when he went before it that, while he had previously not answered questions put to him in correspondence from the tribunal – due to journalistic privilege – after giving the matter some thought, he wished to assist the tribunal. Mr Mooney named Sgt Maurice McCabe as being an officer who made complaints about policing in Cavan/Monaghan back in 2010. He said, around that time, someone, who wasn’t a guard, made “a very fleeting reference to an allegation against Sgt McCabe” to him. He said he “subsequently made an inquiry about that [with a Garda source] and was told categorically that there was nothing in it”. 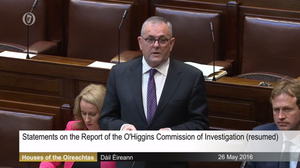 Mr McDowell asked Mr Mooney if he would agree that to give out the details of the Ms allegation and investigation would constitute a negative briefing. Mr Mooney said: “I accept your point of view on that” but later added that he could see both sides. He also told the tribunal that he had no recollection of any journalist ever going up to him and telling him they’d been negative briefed about Sgt McCabe. Daniel McConnell, Juno McEnroe and Cormac O’Keeffe, all of the Irish Examiner, had told the tribunal that they would neither deny nor confirm anything about any conversation they had with Supt Taylor. Juno McEnroe initially sent a letter to the tribunal stating that he had no information relevant to the tribunal’s term of references. But he later told the tribunal he’s claiming privilege and that he wouldn’t be confirming or denying if he had any information relevant to the tribunal. He apologised to the tribunal for his earlier reply to the tribunal. Mr McEnroe did say that neither former Garda Commissioner Callinan nor his successor Noirin O’Sullivan, nor any politician, nor any journalist ever drew his attention to the Ms D allegation against Sgt McCabe. He also said he didn’t become aware of the Ms D allegation until July 2014 – at which point Supt Taylor was no longer in the Garda Press Office as he was transferred to Traffic in June 2014. Charleton: Maybe you’d actually speak plainly and maybe you’d just tell us did you become aware of an allegation of sexual misconduct against Sergeant McCabe at any time while David Taylor was Garda Press Officer in the 23 months ending on 10th June 2014. McEnroe: No, I did not, Chairman. Charleton: Well then, he couldn’t have negatively briefed you, could he? McEnroe: I’d rather not discuss any conversations I might have had with a source or sources. Charleton: And David Taylor was a source? McEnroe: I’d rather not discuss conversations I may have had with sources, Chairman, and I am trying to answer questions but I cannot go further than that. Charleton: It seems to me you are not trying to answer questions at all. It seems to me that you are actually playing games, Mr McEnroe. Mr McEnroe did say that, at the time of Sgt McCabe’s appearance before the Public Accounts Committee in January 2014 – he can recall a question mark was raised over Sgt McCabe. He said: “…this was more gossip, prattle, that somebody raised a question-mark or a doubt around Sergeant McCabe”. “I’ve tried to recall, and I don’t remember specifics that might have been suggested to me or were put to me. I just remember there was a question-mark raised, you know, whether — is he a trustworthy person, or something along those lines, and I cannot be specific. Cormac O’Keeffe, also of the Irish Examiner, said he couldn’t tell the tribunal if he had heard of any rumours about Sgt McCabe in 2013/2014. I don’t want to mislead the Tribunal, I don’t know when exactly I would have heard various things. I came to this story I think relatively late. It would have been — I think my first story that is in the — what was circulated, was towards the end of February 2014. So that would have been when I would have started covering it. So whatever I might have heard in terms of half snatches of conversation or bits of gossip that may have been circulating, it would have, I would imagine, have been February, March, April, May of 2014.
reference I think was in relation to a sexual allegation generally. He also said it’s possible he heard this in 2013. He said he heard it a number of times and that he would have heard it from journalists. He said he was “very cautious” of the information. Mr O’Keeffe also refused to either confirm or deny if he was negatively briefed by either Martin Callinan or Noirin O’Sullivan. And he refused to state whether he got any information from any member of An Garda Síochána. Speaking directly to the judge, Mr O’Keeffe did say he spoke to Mr Callinan “very, very rarely”, he has met Ms O’Sullivan and he had regular contact with Supt Taylor – as he was the head of the Garda Press Office. Marrinan: Do you believe that you have information that would impact on the workings of the Tribunal but you feel obliged to claim journalistic privilege? O’Keeffe: I do feel obliged to claim journalistic privilege. 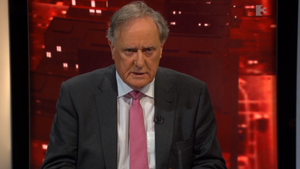 Marrinan: But in circumstances where otherwise you would have information to give to the Tribunal? O’Keeffe: I feel I am unable to answer that question because my obligation is to protect journalistic privilege. Marrinan: Well, can we exclude the possibility that you are claiming journalistic privilege just simply out of a point of principle, regardless of the circumstances in which you find yourself here giving evidence to the Tribunal? O’Keeffe: I am not crystal clear on what you are asking me. Marrinan: Can we exclude the possibility that you are merely, as a matter of course, claiming journalistic privilege here today? O’Keeffe: I think it certainly would be fair to say that I am not coming up here to do something out of a matter of course. I have considered this at some length, I have attended the tribunal as well. This is a considered, and I would admit, it’s a considered position I have taken and it’s an obligation, it’s an obligation on journalists to protect sources. Daniel McConnell, a former group political correspondent at Independent News and Media but who is now a political editor of the Irish Examiner – where he has worked since 2015 – also told the tribunal that he can neither confirm or deny the claim by Supt Taylor that he negatively briefed Mr McConnell about Sgt McCabe. Mr McConnell was writing for INM at the time of the Public Accounts Committee in January 2014 – when the then Garda Commissioner Martin Callinan made his “disgusting” remark – a week or so before Sgt McCabe went before the PAC in a private capacity. He said there was vague “journalistic chatter” about Sgt McCabe at the time but he said it was “very low level, inconsequential, in my view, and certainly something that I never either investigated, looked at, because it wasn’t within my remit to do so”. Supt Taylor claims he would have spoken negatively about Sgt McCabe to Mr McConnell around the time of these PAC meetings, that he would have done so several times and that he did this over the phone. The tribunal saw that there was one mobile phone contact from Supt Taylor to Mr McConnell in early February 2014, one in the second week of March 2014, one in April 2014 and two in May. Leader: Source X gives you information? McConnell: We are speaking hypothetically here. Leader: Totally unconnected to the Tribunal, hypothetical? Leader: Source X says: I was doing something wrong when I gave you that information, I am telling you now that I was doing something wrong, I am waiving any protection, any privilege in relation to the giving of that information, all right? Leader: And not only that, but I am waiving it publicly and I am saying all of this publicly, which is being reported on a daily basis publicly. Leader: So does that source need any protection then, source X, leave Superintendent Taylor out of it? McConnell: Sure. But I come from a position, Ms. Leader, which is different. Leader: No, I’m not asking you where you come from. I’m asking you does that source need protection? McConnell: I’m asking from a journalist’s point of view, the person as a journalist who holds the privilege, it is therefore my obligation to the principle of journalistic privilege that I would not be in a position, even if a source, in my view, moved — or a perceived source or an alleged source moved to say — to waive that privilege, I would not be in a position, I feel, compelled by the obligation that I have to do my job, to start getting into a conversation that you are seeking to bring me into. Leader: All right. I will ask you one more time. Does source X need any protection in those circumstances? McConnell: Yes, I think source X would need protection, on the basis that there are many unintended consequences as to how people might ask a question, where a question is coming from, and also the potential motivations of other people, that may seem irrelevant at a particular time but could become relevant at a later point in date — or a later point in time. Leader: If that source is one of a group of people of 12,000, do you think that source needs protection? There are 12,000-plus Gardaí in this country. McConnell: I’m just not willing to get into a position, Ms. Leader, to start talking about or getting into a process of identifying people. I would like to be helpful to the Tribunal. I have done a lot of work in terms of meeting with investigators, providing my mobile phone number, studying the evidence at play. I would — am genuinely, Chairman, seeking to be helpful to the Tribunal. I just, however, feel compelled to not get into a position where I feel a source of mine or a root of information could therefore be identifiable, I’m afraid I feel compelled I cannot do that. “If, say, someone gave me information two or three years ago or four years ago, and I find myself in a place like a tribunal of inquiry and I am being put under pressure to reveal where information came from, they’d never speak to me ever again, other people would never speak to me again, because the conclusion would be that Daniel O’Connell is someone, when pressure is brought to bear, would sing like a canary. The tribunal resumes on Thursday. Posted in Misc and tagged Maurice McCabe, The Disclosures Tribunal at 3:27 pm on June 18, 2018 by Bodger. there’s no deterrent to lying in a tribunal. That’s why little runts have no problem tripping over themselves with lies while being questioned, because they know there’s no consequences. Rotide. The read more thing doesn’t work on the apps. If we can fix that we can cut it right back. Sorry. How about a link to another page like broadsheet.ie/LongTribunalStuff.html ? Or just replace each post with “Various people said various things. Little to no meaningful progress was made”. While you’re looking this way Bodger, the “latest comments” section is an enigma wrapped in a mystery these days. I have the same problem with app. Going to be snide with me too? Go read up about the disclosures tribunal elsewhere..
oh yea, nobody else is covering it..
use the main site, no biggie..
You could have just said yes and left us all mystified. When you say ‘noone else is covering it’ do you mean Noone else is covering it apart from all the main papers and the state broadcaster? because then you might be correct. Bet they will even get damages on top? 8 years+ of great suffering, private nightmares, public defamation ( that’s you RTE) and state vilification has been laid bare. Thankfully the MC Cabe’s and their 5 children are on a home run with pride, integrity and guts for all to see. Actually, when all this is said and done, will you lads and Olga be putting together a summation of the whole grisly tale? I’d say being able to see the full jigsaw as a whole (so to speak) would be jaw dropping stuff. Please don’t encourage them Mildred. For sure the spinmeisters do not like answering questions. Even so, their evasiveness tends to show them up for what they are. “I have a career to think about, going forward”. And now someone says it as it is. What a bum festering little back water we have. Why not save everyone’s time & money (our money) with this farce. Btw, can Olga please prepare if at all possible for the telly on Thursdays please? I get a warning for the swearing, but no warning for the mumbling & incoherence. Honestly, it is very difficult to listen to & understand. John repeated back what she had just said at one stage, that two witnesses were at complete odds to eachother and Olga is like wha, sorry John what? Then oh yeah, I must be tired. Come on like, how am I expected to follow? Is anyone of the admins watching it back to see what they can improve on? What’s the point in putting in a ton of work if you cant communicate to people? Getting prepare will help somewhat…not one single thought is finished but it’s “oh oh just to jump back a bit there..oh what was I saying again, oh yeah..so uh uh uh..” It’s very frustrating tbh. Sorry Anne. Will do better. It’s obvious yer doing tons of work like.. I like listening to ye on Broadsheet on the telly to get the tribunal updates, I’m just honestly finding it difficult to follow. Is any prep put into it? Like I’ve had to present to 20+ plus people on a few occasions. I’d have to to put an hour in beforehand & have notes prepared on one screen..otherwise I’d be rambling – more than normal and at that I still don’t get it right..
It’s grand having the stuff in your head like, but you have to think of the audience.. if you’re explaining things and the context pops into your head as you’re in the middle of explaining something, that’s easily fixed by putting in a tiny bit of preparation in so you’re mapping out what you’re going to talk about first. There are tools online like mind mapping that are hugely helpful. I don’t know how chat shows on the telly prep, but there’d have to be some prep put in I’d say. Even a few bullet points for yourself or a flow chart. The amount of work yer doing is really admirable and yer the only ones doing it…just find it hard to follow some of it, on the telly anyway. Take it back Anne. Take it back now.